Forged iron frame in antiqued gold leaf, iron cross stretchers. Display shelves are clear, tempered glass. Ideal for use in any room as book-shelf, plant shelf, display shelf or visible kitchen storage space. 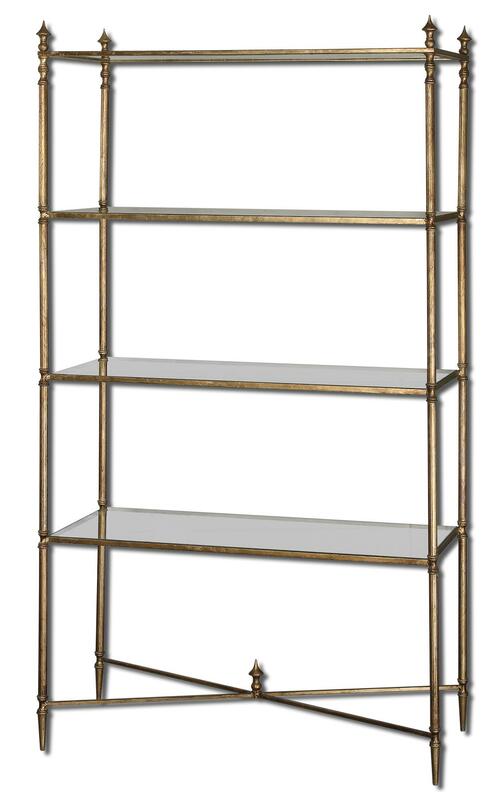 The Accent Furniture - Bookcases Henzler Etagere for Any Room by Uttermost at Miskelly Furniture in the Jackson, Pearl, Madison, Ridgeland, Flowood Mississippi area. Product availability may vary. Contact us for the most current availability on this product.